For those of us tracking the implementation of the Affordable Care Act (ACA), a much-needed update on dental coverage in the health insurance marketplaces has been released. 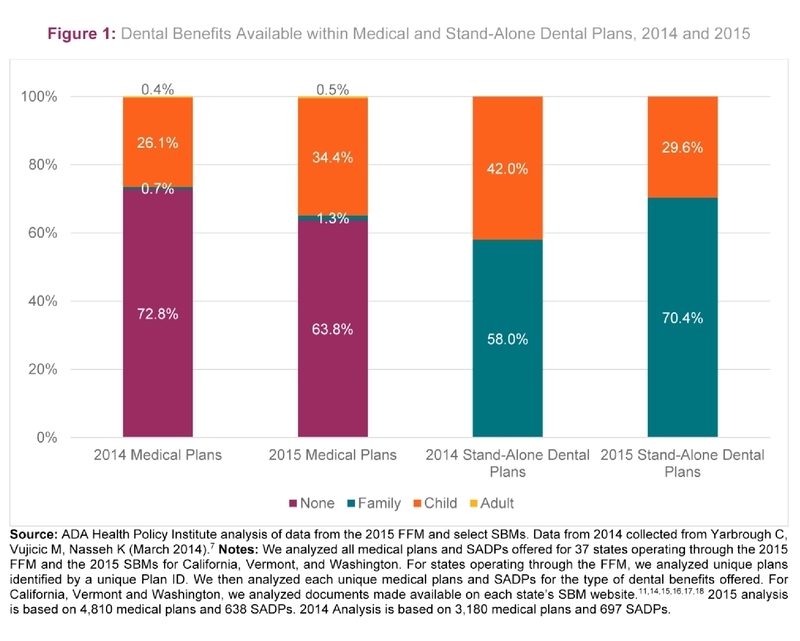 The American Dental Association’s Health Policy Institute recently released a research brief comparing this year’s marketplace dental coverage landscape to that of the 2014 plan year. What they found are some promising changes with regard to premiums, transparency and the inclusion of children’s dental benefits in qualified health plans (QHPs). In its brief, the ADA notes that for the 2015 plan year, more QHPs in more states embedded pediatric dental benefits — about 34% of plans in 2015 compared to 26% in 2014 among the states included in their analysis. While these “embedded” plans provide comprehensive coverage without requiring families to purchase a separate dental plan for their children, last year, CDHP noted that marketplace websites often failed to provide adequate information about how cost-sharing and deductibles apply to dental coverage when its embedded in QHPs. Fortunately, it seems that policymakers were listening. During their analysis, the ADA found that detailed plan information for QHPs is now readily available through Healthcare.gov, making the shopping experience for dental coverage much more transparent to consumers compared to last year. We hope to see that trend continue on the state-based marketplaces as well. Regarding how dental services are covered, the ADA found that QHPs with embedded pediatric dental benefits are more likely to offer first-dollar coverage of preventive dental services compared to stand-alone dental plans. First-dollar coverage is important as it allows children to access critical preventive services without cost-sharing or deductibles. The ADA reports that more qualified health plans in more states have embedded pediatric dental coverage. Interestingly, and perhaps counterintuitively, the ADA also found that among QHPs with embedded pediatric dental benefits, those offering first-dollar coverage tend to be less expensive than those that do not, indicating that the inclusion of children’s dental coverage does not significantly impact the premium of a health plan. That being said, most of the health plans included in the ADA analysis still subject pediatric dental services to the full medical deductible, which is about $2,900 on average. Looking at the cost of stand-alone dental plans in 32 state marketplaces, the ADA analysis showed that monthly premiums for stand-alone dental plans have actually gone down slightly since last year, with average low-cost plans (70% actuarial value or “silver level”) falling to $27.61 from last year’s average of $30.98. While ADA’s analysis of 2015 plans included more states than their 2014 sample, CDHP’s own analysis found a similar decrease in average stand-alone dental premiums in federally-facilitated and partnership marketplaces, with low-cost plans falling in price by about 7% on average across those states. In general, the ADA’s research uncovers some good news for families when it comes to children’s dental coverage on the marketplaces. Consumers have more choices and better information about what’s available to them. We hope these trends persist as insurers as well as federal and state policymakers better understand the needs of children and families entering the marketplaces.